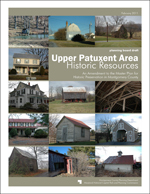 On September 18, 2012, the County Council approved with revisions the Planning Board Draft of Upper Patuxent Area Historic Resources, An Amendment to the Master Plan for Historic Preservation. On November 8, 2012 and December 19, 2012 respectively, the Planning Board and the Maryland-National Capital Park and Planning Commission adopted the amendment as approved by Council. The approved and adopted amendment designates ten sites and one historic district on the Master Plan for Historic Preservation. View the Planning Board Draft (6.4 MB), the Council resolution showing approved revisions, the joint Planning Board/M-NCPPC resolution adopting the approved amendment, and the final status summary table, which shows the final status of the resources and tax parcels. Once the approved and adopted amendment has been published, it will be posted here and available for viewing or purchase at the Planning Department’s Information Counter. Rural resources on 95 tax parcels in northeastern Montgomery County and environs were evaluated for designation on the County’s Master Plan for Historic Preservation. The resources were evaluated for their architectural and historical significance and public interest factors. 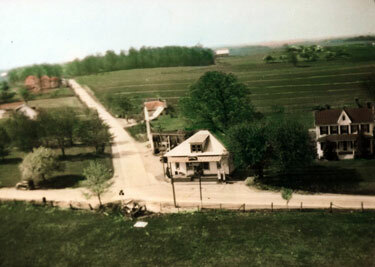 Designations took the form of an amendment to the Master Plan for Historic Preservation. The resources were designated when the County Council approved the amendment and the Planning Board and M-NCPPC adopted it. As part of the process, the Planning Board updated the Locational Atlas by adding and removing evaluated resources. The Locational Atlas is County’s list of resources with potential architectural and historic significance. Resources on the Locational Atlas are afforded limited protections under the Historic Preservation Ordinance (Montgomery County Code, Chapter 24A: Historic Resources Preservation). Resources on the Master Plan for Historic Preservation are afforded broader protections, and may qualify for certain benefits and incentives, including tax credits. Planners began the evaluation by identifying resources on the original 1976 Locational Atlas within the Upper Patuxent (Upper Planning Area 15) in northeastern Montgomery County. The Upper Patuxent is bounded by Frederick County and Parr’s Spring on the northwest; Howard County and the Patuxent River on the northeast; Hipsley Mill Road and Etchison on the southeast; and Kemptown Road, Ridge Road, Planning Area 11, Damascus Road, and Laytonsville Road on the southwest. After surveying the area, planners included three potentially significant resources in the Upper Patuxent that were not yet on the Locational Atlas. They also included resources in Planning Area 10 near Clagettsville and others in Planning Area 14 near Etchison because they adjoined the Upper Patuxent and were related to it architecturally and historically. Two resources, one in Planning Area 10 and one in Planning Area 12, were included in the evaluation at the owners’ request. The vacant Upper Patuxent sites of two resources that had been physically relocated from the survey area (one to Frederick County and one to Planning Area 17) were included in the evaluation and removed from the Locational Atlas. Planners then prepared detailed research forms for the resources to develop their historic and architectural context. In addition, they held a public information meeting and met with various citizens and citizen groups. Subsequently, planners prepared draft amendments and staff reports for the consideration of the Historic Preservation Commission and Planning Board. The Historic Preservation Commission and Planning Board held public hearings and worksessions to evaluate the resources. Planners then prepared the Planning Board Draft amendment, which reflected the Planning Board’s recommendations and actions. The Planning Board Draft was reviewed by the County Executive, and the County Council held a public hearing. The Planning, Housing, and Economic (PHED) Committee and Council held worksessions. The Council approved the Planning Board Draft amendment with revisions, and the Planning Board and M-NCPPC adopted the approved amendment. Meeting and events, along with a record of evaluations and supporting documents, are shown below. The Planning Department will publish the approved and adopted amendment. Download the M-NCPPC staff report and M-NCPPC resolution. The Maryland-National Capital Park and Planning Commission adopted M-NCPPC Resolution No. 12-26 (Planning Board Resolution No. 12-129) adopting the Upper Patuxent Area Amendment as approved by the County Council, sitting as the District Council, per Council Resolution No. 17-538. The approved and adopted amendment designates ten sites and one district on the Master Plan for Historic Preservation. Download the Planning Board agenda, staff report, and Planning Board resolution. The Planning Board adopted Planning Board Resolution No. 12-129 adopting the Upper Patuxent Area Amendment as approved by the County Council, sitting as the District Council, per Council Resolution No. 17-538. The approved and adopted amendment designates ten sites and one district on the Master Plan for Historic Preservation. The Department of Permitting Services was notified on October 9, 2012 of the final status of all resources and properties under evaluation, so that DPS could update its list of properties on the Locational Atlas and the Master Plan for Historic Preservation. DPS was also notified previously, following Planning Board worksessions, of the status of evaluated resources. Download the Council agenda, packet, and Council resolution. 15/20 Mt. Lebanon Methodist Protestant Church – added text stating that that the Planning Board should modify the master planned right-of-way for Damascus Road to avoid transportation/historic resource conflicts. 15/29 Etchison Historic District – added text stating that that the Planning Board should modify the master planned right-of-way for Laytonsville Road to avoid transportation/historic resource conflicts. 15/73 Basil Warfield Farm – reduced the environmental setting by excluding Damascus Road master planned right-of-way within the two parcels; however, from the southern boundary of the property at Damascus Road to 100 feet north of the tenant house, the environmental setting extends to the existing (2012) paving of Damascus Road. Download the Council agenda, packet, and summary. Download the PHED agenda and packet. Download the Planning Board Draft . 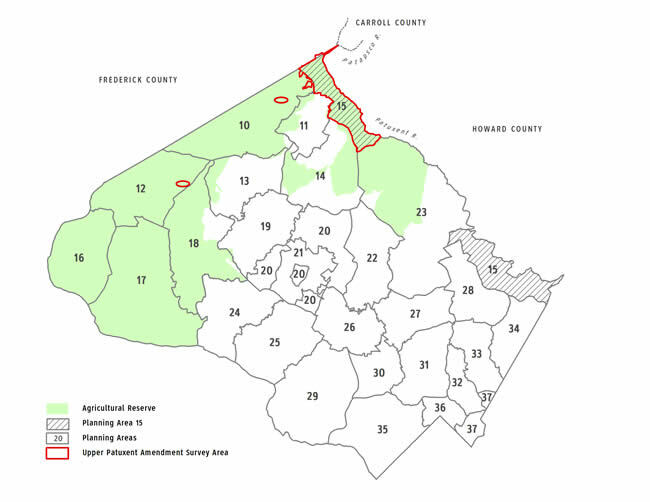 The Planning Board transmitted the Planning Board Draft Amendment to the Master Plan for Historic Preservation: Upper Patuxent Area Historic Resources to the County Executive and County Council on February29, 2012. The Planning Board Draft contains the results of the Planning Board’s evaluation, maps, project context, an area history, a list of resources for future evaluation, and a summary table of evaluated tax parcels and resources. The Planning Board recommended that two districts and 10 sites be designated on the Master Plan for Historic Preservation, that 19 sites not be designated, and that staff and the County Council take up the issue of design guidelines for one of the districts. The Planning Board updated the Locational Atlas by adding three sites recommended for designation; removing 18 of the 19 sites not recommended for designation; and removing 23 parcels that the Board excluded from the two historic districts that it recommended for designation. The Board also asked for the County Council’s recommendation to retain one of the resources on the Atlas if not designated and noted that the Atlas would be updated as necessary following the County Council’s evaluation. The Planning Board Chair reviewed the draft Planning Board Draft in lieu of a final worksession. not designating the Alfred Baker House (15/4)*, the Colonel Lyde Griffith/Merhle Warfield Farm (15/27)* and the Luther W. Moore Farm (15/28). In Clagettsville, the Planning Board recommended designating a 34-parcel historic district, which excludes all parcels north of Moxley Road (28500, 28505, 28510, 28514, 28515, 28520 Kemptown Road and 9915 Moxley Road), plus the three parcels south of Moxley Road (28130, 28218, and 28320 Kemptown Road).The Planning Board also removed the excluded parcels from the Locational Atlas. In Etchison, the Planning Board recommended a five-parcel district that is identical to the district recommended by the Historic Preservation Commission, including 6920, 7000, 7004, and 7010 Damascus Road, and 24220 and 24221 Laytonsville Road.The Planning Board removed from the Locational Atlas 13 parcels it did not recommend for inclusion in the Etchison Historic District. Removed 16 sites from the Locational Atlas and recommended that the sites not be designated on the Master Plan for Historic Preservation: John Moxley House (10/3), John D. Purdum House (10/5), Burdette-Riddle Farm (10/18), James Lauman House (12/10), Matthew Molesworth House (15/2), Rezin Moxley House (15/3), Becraft Farm (15/6), Brown’s Tobacco House (15/7), Captain Clagett-Hilton Farm (15/9), Thompson-Woodfield Farm (15/12), Mullinix Store site (15/14), Warthan-Day Farm (15/19), John O. Etchison House (15/21), Wilson Warfield Farm (15/24), Fred Watkins House (15/26), and log barn site (15/30). Added two sites to the Locational Atlas: Chrobot House (Margaret Price House) (15/71), and Basil Warfield Farm (15/73). Recommended that those two sites and six others be designated on the Master Plan for Historic Preservation: Friendship (10/1), Molesworth-Burdette Farm (15/5), Shipley-Mullinix Farm (15/13), Clagett-Brandenburg Farm and Tobacco House (15/16), Sarah Brandenburg Farm (15/17), Mt. Lebanon Methodist Protestant Church and Cemetery (15/20). The public hearing draft contains the Historic Preservation Commission’s recommendations on whether certain historic resources should be designated on the Master Plan for Historic Preservation and added to, removed from, or retained on the Locational Atlas. Four people testified. Staff presented two options for a Clagettsville Historic District (15/8) and three for an Etchison Historic District (15/29). The HPC recommended against designating any historic district in Clagettsville and directed staff to evaluate six properties within the district as individual resources: a church (15/8-1) and five residences (15/8-2, 15/8-3, 15/8-4, 15/8-5, and 15/8-6). The HPC recommended the Etchison Historic District consist of five parcels: 7010 Damascus Road, 7004 Damascus Road, 7000 Damascus Road, 24230 Damascus Road, 24220 Laytonsville Road, 24221 Laytonsville Road, and 6920 Damascus Road. The public hearing was held as part of the Commission’s consideration of the Staff Draft Amendment to the Master Plan for Historic Preservation: Upper Patuxent Area Resources. Five people testified. 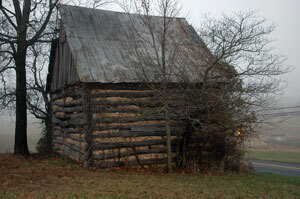 The Clagett-Brandenburg Farm tobacco house is one of the last intact log tobacco barns in Montgomery County. The HPC unanimously approved the staff recommendation, finding 16 resources failed to meet the criteria for architectural or historical significance and recommending that the Planning Board remove these 16 resources from the Locational Atlas. Preservation planners held a public meeting at the Damascus Recreation Center to discuss Montgomery County’s historic preservation program and provide an overview of the ongoing evaluation of Etchison, Clagettsville and area properties for possible designation in the County’s Master Plan for Historic Preservation. Planners surveyed resources in Planning Area 10 and Upper Planning Area 15, and parts of Planning Areas 12 and 14. They then prepared a detailed research form for each resource with initial architectural and historical information.